Please stop complaining amongst yourselves and be constructive will you ? Go to there " contact us ' section on the left hand side of the home page ! If The Australian Government Don't Take The Lowly Institute Seriously, Why Should We ? anyway, its now a propoganda piece over here - the radio news on every station over the last 24 hours has had this Lowy Institute 66% percent support" story running non stop - its the first news item on all the radio stations over here. looks like the Ministry of Information has gone into overdrive on this one. problem with propoganda though is that the outcomes don't create anything viable and/or sustainable for development because in its essence propoganda is about "mind control" i.e manipulation. NON TRANSPARENCY. its just a variation on violence - thats the whole idea. its no longer an attempt to subdue and control people by violence, but by information manipulation - though in the end, as in the case of violence it never creates any sustainable foundation for development because the people's choices and consent are not of their own deliberate and informed "freewill" - its manufactured consent via NON TRANSPARENT MEANS of information control and manipulation. this one takes the cake....eh? Permanent Secretary for Information reckons FB is more popular then Gillard ! Gillard runs a country which is booming economically and is not at the EU begging for $EU 300 million - she won her PM's position through free and fair elections, she did not appropriate her position at the barrel of an M16 and she presides over a country where she doesn't need a PER to run the country because she governs with the consent of her people and doesn't need a company of the Australian Defence Forces stationed around her house 24/7 because she is worried about the ADF mutinying against her - nor does she travel around with an entourage of heavily armed bodyguards in that regard either. she didn't chase Parliamentarians out of the senate in Canberra and disolve it - she didn't kick the Australian Judges out and trash the Australian Court system. and she doesn't preside over an economy where nobody wants to invest because they don;t trust the Govt or its systems - investment in Australia is booming. and she doesn't go around having her own people write up dodgy polls, ala Tebbutt Research, and flogging it off as "justification" for her rule - because her rule (as does the rule of every other Prime Minister and Federal Govt in Australia since the formation of their Federal Union) doesn't depend on flawed and fundamentally suspect and dodgy pollsters and dodgy polls, but on the CREDIBLE VOTE of every FULLY INFORMED Australian citizen which is ballotted at free and fully TRANSPARENT and fair elections conducted every three years. Prime Minister Commodore Voreqe Bainimarama is more popular than the Prime Minister of Australia, Julia Gillard says Fiji’s Permanent Secretary for Information Sharon Smith-Johns. Referring to the recent opinion poll carried out by the Australian Lowy Institute, Smith-Johns said the poll shows the difference in the leadership quality between Commodore Bainimarama and Gillard. “With a 66 per cent approval rating Commodore Bainimarama is almost three times more popular with the people of Fiji than Gillard is with the people of Australia,” she said. Smith-Johns said the poll has proven that the Fijian government is committed to the policies of good governance and has courage to do what is right for the people, if Fiji is to make progress. “The citizens of Fiji approve Commodore Bainimarama and the government by a huge margin. So if our own people think we're doing a good job and that's all that matters and it’s thanks to the Australians themselves in the form of the Lowy Institute,” she said. She said this by no means suggest there isn’t still a massive amount of work to be done prior to elections in 2014. “We have a long way to go, however it certainly indicates that the reforms are reaching the people and they approve of the direction the Bainimarama government is taking them,” Smith-Johns said. Meanwhile poll was conducted on the main island of Viti Levu in August and polled 1,032 people. The poll report revealed Commodore Bainimarama has good support from 66 per cent of the people polled, and 65 per cent believe Fiji is heading in the right direction. An overwhelming 95 per cent of people support the right to vote in a free election, and around half the people felt the government is doing a good job making progress to elections. i've been reading Goebells diaries over the last two weeks - his mind and his reasonings - and his emphasis on propoganda and the theoretical underpinnings of that philosophy. its an interesting look into the mind of one of the worlds greatest propogandists - if you think about it, he did something which was phenomenal at that time - took mind control over the whole of Germany - and the Germans have never been dunces - they are one of the most intelligent and advanced nations and societies on earth - all the great philosphers and musicians and academics and scientists - and all the great institutions of learning with their hundreds of years of intellectual excellence was simply no match for Goebell's bullshyte. super industrial Germany and all her greatest thinkers and intellectuals and academics and her liberal advances in everything from engineering to medicine to law to music to art all taken over by this thug from the beer halls of Munich and his propoganda. that Teutonic and proud martial race of free thinkers and great intellectuals fallen for the sweet talking sound bytes of a beer hall thug. what makes human societies fall for Lucifers tongue ? i mean this is all deciet. pure and simple. propoganda, call it what you will.....the essence is deceit. The Army’s very strange webpage on "Voice-to-Skull" weapons has been removed. It was strange it was there, and it’s even stranger it’s gone. 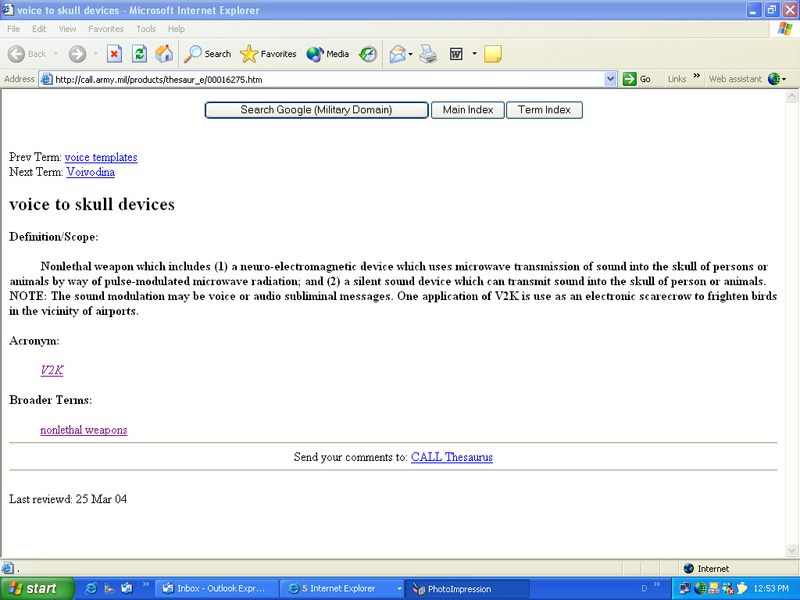 If you Google it, you’ll see the entry for "Voice-to-Skull device," but, if you click on the website, the link is dead. onlethal weapon which includes (1) a neuro-electromagnetic device which uses microwave transmission of sound into the skull of persons or animals by way of pulse-modulated microwave radiation; and (2) a silent sound device which can transmit sound into the skull of person or animals. NOTE: The sound modulation may be voice or audio subliminal messages. One application of V2K is use as an electronic scarecrow to frighten birds in the vicinity of airports. The U.K.-based group Christians Against Mental Slavery first noted the change (they also have a permanent screenshot of the page). A representative of the group tells me they contacted the Webmaster, who would only tell them the entry was "permanently removed." The image above is one person’s self-styled depiction of how a "voice-to-skull" weapon might work. This goes back into mass media and effects of Television on the mind. If you experience "mind fog" after watching television, you are not alone. Studies have shown that watching television induces low alpha waves in the human brain. Alpha waves are brainwaves between 8 to 12 HZ. and are commonly associated with relaxed meditative states as well as brain states associated with suggestibility. While Alpha waves achieved through meditation are beneficial (they promote relaxation and insight), too much time spent in the low Alpha wave state caused by TV can cause unfocussed daydreaming and inability to concentrate. Researchers have said that watching television is similar to staring at a blank wall for several hours.. I enjoy watching television on occasion, and this article is not meant to suggest that people should never watch TV. However, it is only fair that people understand what happens to the brain each time it is exposed to television. Most people would benefit from cutting television time; in addition, research has shown that persons with ADD or ADHD tend to have too much Alpha, Theta, and Delta wave activity and, therefore, would benefit significantly from a reduction in TV. Television certainly contributes to a reduced ability to concentrate for anyone, but especially those who already have an overabundance of Alpha waves. Reading (a book or magazine, for instance-- not televised text. It is the radiant light from a television set that is believed to induce the slower brainwaves ) and writing both require higher brain wave states. If you want to keep your brain focused and your attention strong, it is a good idea to cut your television time. Sitting quietly for a few minutes, painting, singing, reading, or going for a walk, are better for you in all ways. Effects of TV flicker rate on viewer. Complicit in the destruction of Indigenous Fijian Culture the MASS MEDIA has been found guilty of abetting treason, sedition, murder, genocide and other high crimes.The gap between rhetoric and reality in Fijian life is so large that no one believes what they are hearing from the hostile elites that dominate public discourse. No Amount of Propaganda can gloss over the realities now unfolding. The Lowy Institute from Australia findings just confirms that everything about Fijian Politics, Economy, Statistics, Propaganda, etc, etc are determined by outside forces. Just shows what a nuthead Smith Johns is by comparing the two as differences are so stark: one is elected, other isn’t; female is educated while other is an uneducated hooligan, one is voted in by the people, the other seized power through guns. That’s on the first level. Secondly, we need to question the method used in arriving at the conclusions: sample- how did they select the sample? How many took part in the poll? Ethnic distribution- Fijians, Indians, Chinese, etc? Gender distribution? How many males/females from each ethnic group? How was the poll conducted? Phone? Text? Face-face? In what language? English or Fijian/Hindi/Chinese? Location of sample – urban, rural, villages? settlements? Two things need to be determined in an opinion poll- the reliability of the method used and sample. Otherwise the results are invalid, unreliable and fails the test of a sound research! Lastly, who did the polling? what is their qualification? This will go back to Teebutt researchers- are they qualified researchers? So I wonder where Sao got his 99.8%? Ting Tong got it right – where is the Lowy Institute’s responsibility in this? It is a bit like polling Libyans before Ghaddafi’s fall: pointless. I bet that the researchers are probably are having daily personal correspondence with the Ministry of Propaganda – like the same relationship that Michael Fields seems to have. Hypocrisy. @Sireli. Soon Sharon the Delhi Solution will be the only options for people to demonstrate their frustration on the volumes of lies that's happening in the country. We the People have very limited choices. These are the rules, of their choosing, not ours. But they are the reality of a situation as harsh as it is immutable. IT IS WAR. Only a fool and a weakling would ask for it to be otherwise.